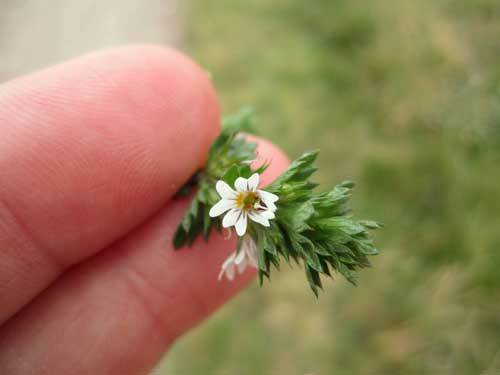 In herbal medicine, we use the aerial parts of Eyebright; a short lived herb that can reach up to about 30 cm in height. Its leaves have jagged toothy edges and its flowers also vary between white, red or yellow, they usually have a yellow spot in the throat. The botanical name for Eyebright comes from one of the Greek Graces ‘Euphrosyne’ which means ‘Gladness’. Its common name is not accidental and Eyebright has some wonderful folk-stories attached to its reputation for improving eye-sight and healing diseases of the eye. 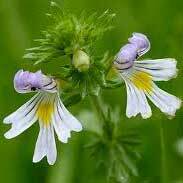 From how it earned its name Eyebright has, of course, chiefly been used to assist with ailments of the eyes; conjunctivitis, red-eye, styes, itchy eyes, stinging eyes and weak vision from diverse causes. Eyebright had the folklore reputation to be able to restore sight to people after their 'three score and 10' (70 years of age). Whilst this probably sounds like a complete exaggeration it should be considered that many such ageing people may have had degenerative changes to the structure of their eyes that could have been considerably improved with the regular use of Eyebright. The influential Roman physician Dioscorides was particularly fond of using it for the many eye infections he saw whilst accompanying the Roman Legions through their rather numerous trips around Europe at the time! 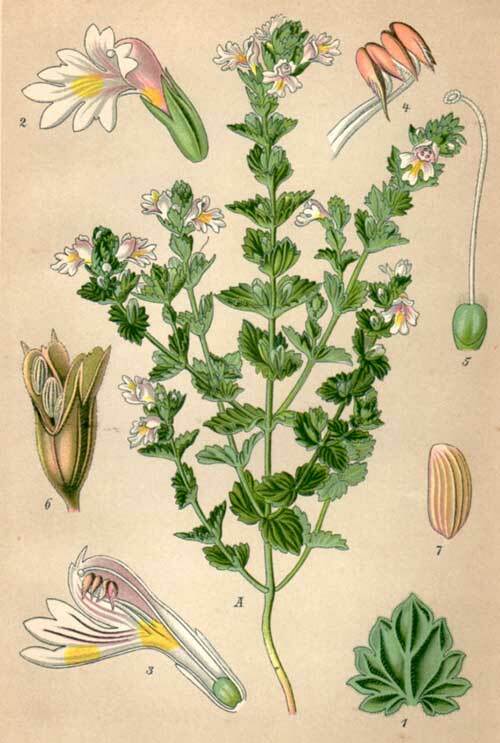 Eyebright was used by the Scottish Highlanders in a lotion mixed with milk and applied to the eyes with a feather and in Iceland the expressed juice was used to treat a variety of eye complaints. 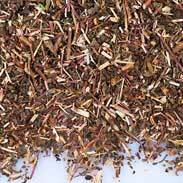 T Bartram describes its actions as anti-inflammatory (in an eye-lotion), antihistamine, anti-catarrhal and astringent. Bartram writes that 'many causes of eye troubles in later life date from measles in childhood and advises an Eyebright lotion during measles to prevent eye troubles'. He says it 'has special reference to the eyes, nose and throat and is good for conjunctivitis, red eye, styes, poor visual acuity due to eyestrain or diabetes, itching or stinging eyes'. He recommends it as a gargle for 'relaxed tonsils and sore throats' and as a wash for blepharitis, watery catarrh, hay fever, chronic sneezing and inflammed nasal mucosa' as a wash.
To counterbalance this however, T J. Lyle writes, In cases of congestions and inflammations of the eyes, especially of any torpid grade, it is valuable as an eye-wash. It is an astringent but is not drying and hence is more toning to the membrane. 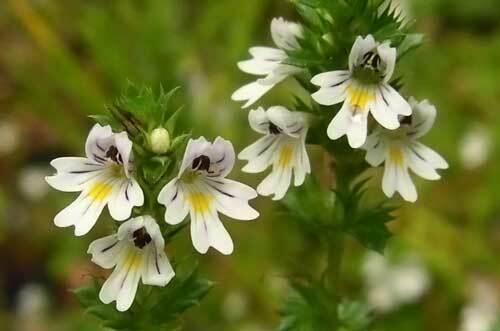 Euphrasia will be found very useful for the relief of acute inflammation of the eye and for opacity of the cornea and when there is an acrid secretion of either eyes or nose with heat and pain. Eyebright is very safe to take internally by the young or old, whilst pregnant or breastfeeding however great caution is required in using Eyebright to bathe the eyes in whichever form it is used and I strongly encourage people to carefully follow the steps at the bottom of this article to ensure no unwanted foreign material is introduced to the eye when using it as a direct treatment for eye problems. Having personally used Eyebright for my own occasional eye troubles and having recommended it to many hundreds of patients I can say with complete confidence that Eyebright really is a marvellous remedy from Nature for the eyes. Its effects on red, sore or infected eyes are remarkably good and it works gratifyingly quickly. Eyebright combines a soothing, astringent; (toning), cleansing and anti-inflammatory action that almost always seems to relieve eye pain or fatigue very rapidly. The benefits of using Eyebright regularly for weakened eyesight and strained eyes cannot be overstated and a simple eyebath once a day every day may prevent a great many troubles in time to come if a person adopts this painless and simple habit (some instructions on 'how to' given below). 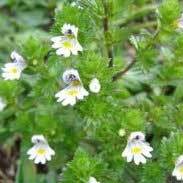 I have also occasionally used Eyebright in tea or tincture formulae where I want a particularly soothing medicine for the mouth and throat. 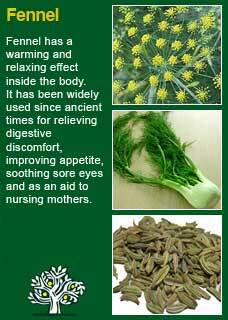 I think that this is a herb that works best when it is in direct contact with the body. A tsp in a cup of water, infused for just 5-10 minutes will give an active medicine, or as little as 1 or 2 mls of the tincture that we make as a 1:5 in 40% ethanol. Eyebright combines perfectly with Chamomile and Fennel for treating eye problems and there is another recipe that uses those herbs as well written up in the section on eye problems here. 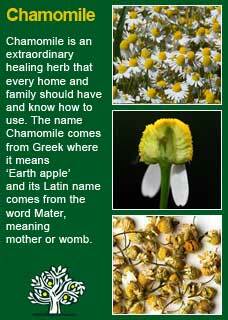 Take 10 drops of Eyebright tincture or 30mls of well strained and freshly made Eyebright tea. If using the tincture pour 30mls of freshly boiled water over the drops and allow to cool to a comfortable temperature but don't use it cold i.e. keep it warm to some extent! Using an eye-cup that has been rinsed with boiling water pour the eye-cup to about a third full. Place the cup over your eye and tilt your head back, making sure you open and shut your eye a few times and also making sure you look side to side and up and down whilst your eye is open to let the herb solution to get everywhere. Discard the used solution and repeat at least twice, putting fresh solution into the eye cup each time. If the eye is bad then the treatment needs to be repeated frequently until resolved. Regular use of this treatment is may strengthen weakened eyes - use patiently. Much of the information here about the traditional uses of Eyebright is consistent with the model of thinking whereby one may treat problem A with plant B. There is value in this approach, especially in how it helps us pass on useful knowledge to one another, but it falls short in one vital area; and that is that people are not all cut from the same cloth! Something that works brilliantly for one person may do less for another -- why is this?